Today’s Friday Find is a delicious segue from winter into spring. Assuming we have seen the last of winter’s weather, our thoughts may now turn toward potting soil, sandal weather and wishfully thinking about sunglasses. Dare we dream of playing Frisbee on the beach, feasting on the freshest of seafood bounty while watching the blazing orange sunset in all its glory? Let us not get ahead of ourselves. As marvelous Northwest whites and rosés are being bottled as we speak, summer is sure to be delicious. But, what about today? This Friday Find is the answer. 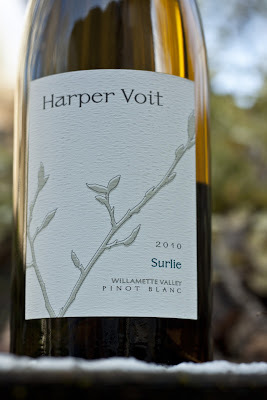 The 2010 Harper Voit Surlie Willamette Valley Pinot Blanc is Drew Voit’s gift to all of us for surviving the soggy winter. The Surlie moniker refers to the wine being aged sur lie which means “on the lees”, imparting a very enjoyable creaminess on the palate. Neutral oak barrels were used for fermentation. The wine is crisp and light, yet creamy, lithe. Imagine a spoonful of lemon curd topped off with a dollop of freshly whipped cream and lime zest – citrusy, bright, with a smooth texture. A tiny touch of smokiness strikes a balance with the pineapple laced acidity. You may have heard Drew Voit's name before. The winery's website tells us why. "Previously the Associate Winemaker at Domaine Serene Winery, Drew currently oversees winemaking and vineyard management for the renowned Shea Cellars in the Yamhill-Carlton AVA of Oregon's Willamette Valley. Harper Voit is his private label and the ultimate expression of the sites he has hand-selected from among the best in the new world." The Harper Voit Surlie Pinot Blanc is available online through the winery for $20, in Portland at Storyteller Wines, Zupan’s on Burnside, Oregon Wines on Broadway, Vinopolis, PDX Bottle Shop and in Salem at Grand Vines. Looking for a glass pour? Find Surlie by the glass at Davis Street Tavern, June, Noble Rot, Corkscrew, Andina, Little Bird, EaT: An Oyster Bar, Caps and Corks and St. Jack Restaurant. Planning a day in wine country? Take time to visit one of these places and enjoy a glass: The Allison Inn’s JORY Restaurant (Newberg), Bistro Maison or Thistle (McMinnville), Ponzi Wine Bar or The Dundee Bistro (Dundee).